Akash Ahuja aka Ka$h knows two things - music & business. And did you also know that he's only 15!? We stumbled across Ka$h sometime last year when he was dropping his video "Picture Perfect" and we dubbed him the as 14 Year Old Desi Kid who will change The Rap Game. Guess what, he is still on that mission. Now he's ready to drop his 4th album at the age of 15 - that's more than some of the 25 year olds trolling around Los Angeles for a deal worked on! 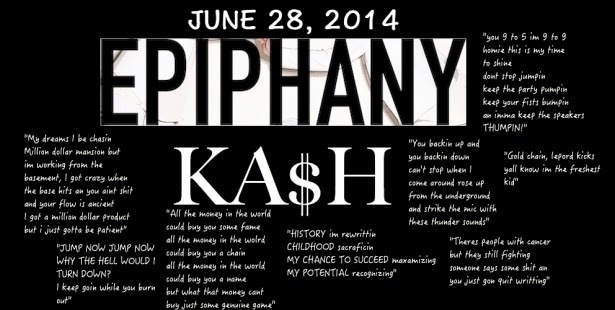 Ka$h has collaborated with a bunch of upcoming artists on Epiphany and you're definitely going to be floored with what you hear. His collaborations include the likes of RiSK, A-B-E, DUBWORK, Young Henson,and Eddie Davis This 19-track album is his best work yet. Ka$h decided to go all-out with this one and made sure it was a hit. His talent is showcased in ways that most 15 year olds aren't even thinking about. When I was 15, I played with friends and watched way too much TV and sports. And WWE was like the Holy Grail. Ka$h just showed the world what a 15 year old should really be doing, following his dreams! His way of playing with friends means recording a dope song in a beautiful recording studio. His way of watching TV & sports is shooting a new music video, and then watching it on his big screen TV with his pals. As long as Ka$h continues to follow his dreams and works hard to achieve them, this west coast Desi rapper is bound to hit the billboard top 10 list in no time! How do I know? Because with hard work and belief comes success in numbers. So, we, at DesiHipHop.com applaud young Ka$h for doing what he's doing, and you can be sure that we will do everything we can to make his dreams come true! PRE-ORDER Now! - Available EVERYWHERE June 28th! Join the 'Epiphany Club' & we'll let you know when the album drops!